Our aim was to structurize all existing and new plans for raising the standards in football on the island. 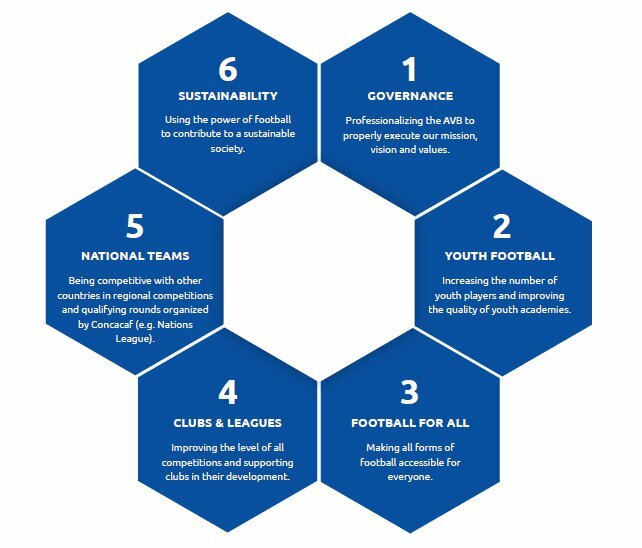 Based on club-assessments, interviews and desk-research we wrote a strategy plan that consists of six strategic pillars translated into measurable action plans. Developing a long-term strategy to raise standards in football on the island. After visiting the island of Aruba the Aruban Football Federation (AVB) asked NMC Bright to help developing a long-term strategy for the federation. Based on club-assessments, interviews and desk-research NMC Bright wrote a strategy plan that consists of six strategic pillars translated into measurable action plans. The strategy plan describes how football in Aruba is able to develop in the forthcoming years and guides the AVB as an organization with implementing a long-term strategy. NMC Bright supports the process of formulating a strategy, be it in a specific domain like a football or a general strategy. We know what questions to ask and information to gather. Please contact us if you want to know more about the way we can support you.